Central Intelligence Agency chief John Brennan flew to Pakistan last week for a clandestine meeting with army chief Gen Raheel Sharif to discuss a possible military operation against militants in the country's northwest, a media report said on Monday. The two officials discussed "highly sensitive issues of mutual interest", including air strikes conducted in tribal areas since last week and the "prospects of a likely military operation after the apparent failure of the Tehrik-e-Taliban Pakistan-government peace negotiations", The News quoted its sources as saying. 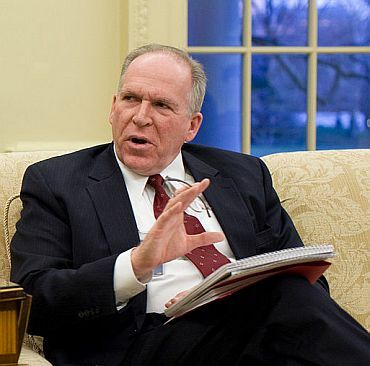 According to the report, Brennan met the Pakistan army chief on Friday. A senior official of the US embassy told PTI that they were looking into the matter. Asked specifically if there was confirmation or denial of the meeting, the official said, “We have seen the report and we are looking into it." Pakistani combat jets targeted militant bases in the restive tribal areas days after the government suspended peace talks with the banned TTP Pakistan after a militant faction executed 23 troops abducted in 2010. The CIA chief's reported visit comes at a time when the US spy agency has put its drone campaign in the tribal areas on hold. Pakistan and the US are also holding talks in Washington on Monday to promote defence cooperation. Defence Secretary Asif Yasin Malik is leading the Pakistan delegation at the talks, part of regular consultations between defence establishments of the two countries. Relations between the Pakistani and US security establishments touched the lowest point after the May 2011 American raid in Abbottabad that killed Al qaeda chief Osama bin Laden. But the two sides have reached out to each other as US-led forces prepare to leave Afghanistan by the end of the year. On February 19, Gen Lloyd Austin, Commander of the US Central Command, met Gen Sharif and discussed matters of bilateral interest, the regional security situation and the withdrawal of US-led forces from Afghanistan. According to the report in The News, Austin and Sharif may have discussed the possibility of sealing the Afghan side of the border if Pakistan decides to launch a military offensive against the Taliban in Waziristan. Brennan’s meeting with Sharif was his first interaction with the Pakistan Army chief since he assumed his office. The heads of the spy agencies of the two countries last met in August 2012 when ISI chief Lt Gen Zaheer-ul-Islam visited Washington for talks with then CIA director David Petraeus. Following the November 1, 2013 killing of TTP chief Hakimullah Mehsud and subsequent suspension of North Atlantic Treaty Organisation supply routes through Pakistan, Pentagon chief Chuck Hagel travelled to Islamabad on December 9 in a bid to set relations on an even keel.